Logic Supply’s CL210 is a compact, low cost, fanless edge gateway built for reliability. The system includes a wide array of features that are critical for deploying dependable, long-lasting access control and monitoring solutions. The CL210 may be small but its compute capability, powered by an Intel® Celeron N3350 processor, packs a punch for its size. The CL210 adds valuable computing power at the edge for security applications like network monitoring, access control, surveillance and biometrics. Here are just a few of the features that make the CL210 well-suited for security applications. Security and surveillance solutions are by nature mission critical. Failures can not only result in expensive downtime, but can also put individuals or infrastructure at risk. To give our customers the most reliable solution possible, we designed the CL210 around several key features that extend lifespan and durability while lowering the total cost of ownership. First and foremost, the CL210 has a completely solid-state, all metal housing with no moving parts. In addition to the benefit of silent operation, this eliminates two of the most common failure points: the fan and the hard drive. Not only is the CL210 fanless, it is also ventless. Without the need for airflow vents, the systems is protected from exposure to the dust and other particulate matter that is common in many of today’s most challenging security environments. Every surface of the CL210 is designed to dissipate heat while offering maximum EMC immunity to RF and ESD events. The device’s exacting tolerances enhance ingress protection, greatly reducing the ill effects of dust-transported corrosive substances over time. The CL210 is equipped with a range of connectivity options to enable easy interfacing with peripherals, other hardware and local or cloud-based networks. In addition to wireless network connectivity, an optional 4G upgrade allows for integrated cellular connection to the cloud from almost any location. 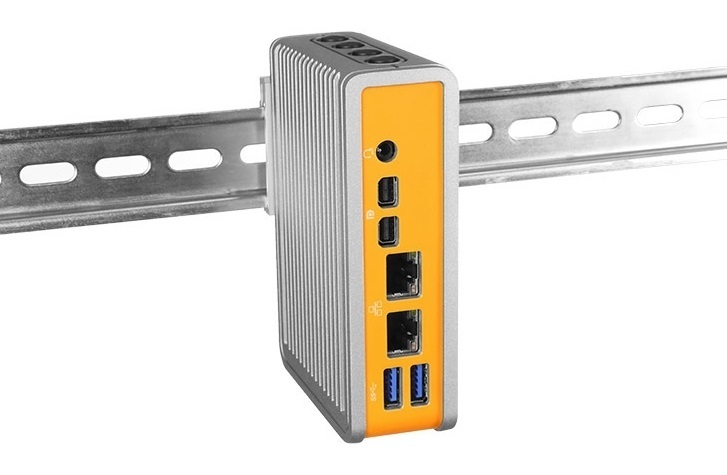 Additionally, the system boasts dual LAN ports for ease of connectivity to multiple networks without the need for an additional gateway or modem. One of the biggest challenges in deploying security solutions is finding an embedded PC that will fit within the limited space available for hardware. With that in mind, Logic Supply developed the CL210 with a sub-2” profile to fit within the tightest space requirements for security, access control, building automation and other embedded integration. The system also weighs less than a pound, allowing for installation wherever it’s needed. The CL210’s versatile I/O coastline enables connectivity to a number of smart devices or cameras. The system can connect to 2 devices by USB and 2 through LAN ports, offering support for up to 4 cameras depending on configuration & connectivity. The CL210 includes Intel’s Platform Trust Technology (PTT), a firmware-based implementation of Trusted Platform Module (TPM) hardware security. PTT allows organizations to establish the same, rigorous levels of security in its compact, fanless systems and devices as it does for desktop PCs, workstations and servers. PTT-enabled IPCs radically shrink the attack surface for systems that often sit unattended in remote or public spaces. The CL210 is priced to provide great value for surveillance & security applications without losing the features you need, starting at just $295 for a pre-configured, ready to ship model. If you are interested in seeing what the CL210 can do for your security application, Logic Supply offers TryLogic, our no-risk prototyping program. Visit the TryLogic page and order your prototype CL210 system today! In summary, if you are looking for a highly dependable security gateway, take a close look at the CL210 from Logic Supply. If you’re building a security project, build it with Logic!